To view and export lists from your stats reports, go to any stats details page. Then click any stat type, from the tabs on the left, to display the contacts that fall into each stat category. Once you have the stats details you need, there are 2 main options for sorting through your data. 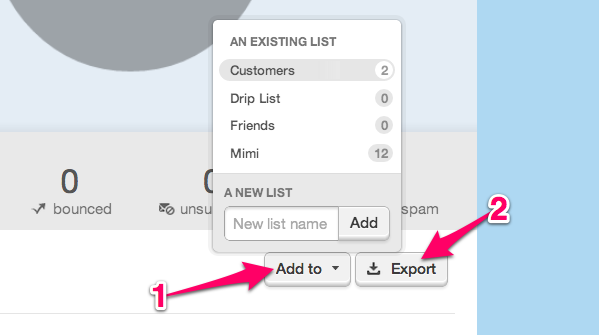 With this option you can create new lists from stats, or add contacts to an existing list. This option is perfect for segmenting your contacts to send a new campaign, based on past action. Then choose the Add to... button. Create a new list name. When you click over to your subscribers, you’ll see that new list there, with just these engaged contacts from your stats area. Select this list for your next send. So what if you want to send to only the "Accepted" contacts, or contacts that did not view this campaign? Just create a list from the "Viewed" tab, and exclude that list from the next mailing. If you like to keep external records, then the export function is for you! Just choose your desired stats tab, and then click the Export button in the upper right of the list view. GoDaddy Email Marketing sends you a file of the contacts, along with any relevant mailing data. For example, if you’re exporting bounces, you’ll see send times and bounce reasons next to each contact. How Do I View Click Lists For Each Link In My Campaign? Can I Share My Stats? Do I need SPF or DKIM validation to send campaigns?